Mehr-un-Nissa(1577-1645), entitled Nur Jahan (Light of the World), was the fourth child of Mirza Ghiyas Beg, a noble from Persia, and of his wife, Asmat Begum. She was born after the family had migrated to India. Her father served the Mughal emperor Akbar, who bestowed him with the title of 'Itmat-ud-daulah' (Pillar of the State), while her brother Asaf Khan served Jahangir and the next heir to the Mughal throne. After she became a widow in 1607, she became the last and favorite consort of Mughal Emperor Jahangir (1569-1627) in 1611. For the rise from an immigrant to become an Empress of the great Mughal empire, Nur Jahan was one of the most influential women of her era. Nur Jahan's illustrious reign (1611-1627) saw her effectively shape the expanding Mughal Empire, along with her immense contributions to religion and flourishing overseas trade. 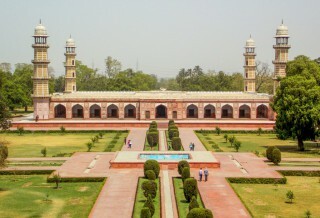 Mehr-un-Nissa was first married at the age of 17 to a Persian adventurer named Sher Afghan Ali Quli Khan Istajlu, who was renowned for his brilliant military career, and from whom she bore a daughter, Ladli Begum Having survived Jahangir by 18 years, she died at the age of 72 years and the mausoleum was most probably constructed during her lifetime. 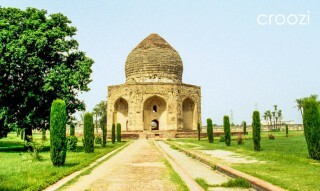 The mausoleum is located in Shahdara Bagh, not far from the tomb of Jahangir. 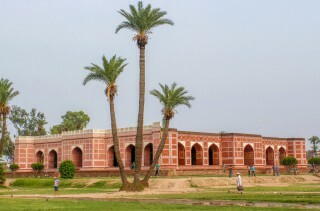 The tomb of Asif Khan, her brother, is also located nearby. The tomb took four years to complete at the cost of Rupees three lakhs. Some historians[who?] believe that during the reign of Maharaja Ranjit Singh, the whole of the tomb was stripped of its ornamental stones and it was ordered that the subterranean room which contained the queen and her daughter were opened. The tomb underwent minor repairs but is slated for major restoration.